3-Robert Wilson Walker was born on 20 Mar 1864 in Exton, Tasmania and died on 20 Jan 1959 at age 94. Another name for Robert was Michael. 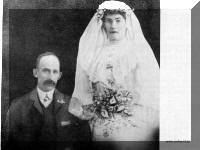 Robert married Sarah Annie Ferguson in 1906 in New Zealand. Sarah was born on 16 Jun 1875 in New Zealand and died on 10 Jun 1965 at age 89. Robert was the first of the Walker family to leave Tasmania and for many years, contact with his relatives here was lost. During 1984, we regained contact with Robert's son Cyril and he and his wife and some members of their family were able to attend our reunion in March, 1985. Cyril has given us the following account of his parents' lives. We think Dad arrived in New Zealand from Tasmania during the late 1880's or early 1900. He landed in Dunedin, South Island. After a short time there he sailed for Nelson. He had only been in Nelson a while, when he found out there was work at a coal mine in Puponga further across the bay. He arrived at Puponga on a coal ship, and he was fortunate in getting employment but he had to live in a tent for some considerable time before being able to obtain a hut. We don't think he worked in the mine very much, mostly working in the bush, cutting timber for mine props. While there, he met Bill Ferguson, who later became his brother-in-law. After several years he moved to Pakawau, about seven miles from Puponga. There he drove steam winches, hauling logs for a saw mill. While living at Pakawau he met Sarah Ferguson, who along with her parents and brothers and sisters, also lived at Pakawau. Later he and Sarah married. He then went farming in partners with Bill Ferguson, his brother-in-law. The large sheep and cattle partnership farm was at West Haven, situated on the west coast, some miles from Pakawau. The latter part of the journey meant travelling through mud-flats, which of course was passable only when the tide was out. Dad also had a small farm at Pakawau and was usually home at weekends. He remained farming for the rest of his working days. Mum milked four cows on the small Pakawau farm, made butter and sold it to the Puponga miners. She also grew vegetables and sold them. Pakawau was eight miles from Collingwood, the nearest town. Groceries and mail were delivered by horse and cart once a week. Mum was a very good cook, baked all our bread, cakes, jams, sauces, preserves etc. She also made soap. She was also very good at sewing, making garments for the family and for many of the neighbours. Cyril remembers arriving home from school, Mum had made a pair of trousers and the first thing for him was try them on to be sure the fitting was right. Besides all this Mum took part in Church-work making and providing for the Church Guild sales tables. Also my sister Lorna played the organ for church services for many years. 4-Amy Beatrice Walker was born on 14 Jul 1902 and died on 11 Jul 1969 at age 66. 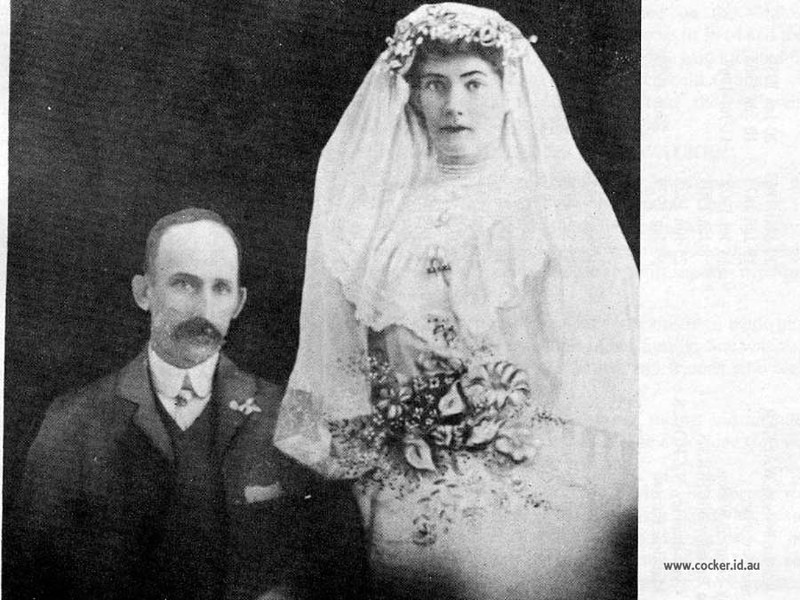 Amy married John Bramley Nicholls. John was born on 8 Jan 1901. They had two children: Lyle Bramley and Cyril Bramley. 5-Lyle Bramley Nicholls was born on 19 Sep 1926. Lyle married Beverley Joyce Wilson. They had three children: Wilson Bramley, Glyn Dement and Danielle Joyce. 6-Wilson Bramley Nicholls was born on 20 Jan 1963. 6-Glyn Dement Nicholls was born on 16 Oct 1965. 6-Danielle Joyce Nicholls was born on 12 May 1968. 5-Cyril Bramley Nicholls was born on 25 Jun 1928. Cyril married Marjorie Barrow. Marjorie was born on 19 Jan 1929 and died in Jun 1959 at age 30. They had three children: Anthony John, Brenda Joy and Gary. 6-Anthony John Nicholls was born on 5 Jul 1954. Anthony married Sharon Willis. They had two children: Mark and Rochelle. 7-Mark Nicholls was born on 10 Mar 1974. 7-Rochelle Nicholls was born on 15 Sep 1976. 6-Brenda Joy Nicholls was born on 23 Sep 1956. Brenda married Charles Wallace McKay. Charles was born on 10 May 1957. They had two children: Shane Wallace and Julie Elaine. 7-Shane Wallace McKay was born on 10 May 1975. 7-Julie Elaine McKay was born on 30 Dec 1977. 6-Gary Nicholls was born on 25 Oct 1958. Cyril next married Jennifer Octavia. Jennifer was born on 5 Jan 1939. They had six children: Donald Gregory, Kaye Joanne, Sandra Jane, Kerry Robert, Roseanne Rae and Brett Kenneth. 6-Donald Gregory Nicholls was born on 4 Nov 1958. 6-Kaye Joanne Nicholls was born on 11 Nov 1960. Kaye married Shane William Conaghan. Shane was born on 28 Sep 1961. They had one son: Mathew Paul. 7-Mathew Paul Conaghan was born on 11 Jun 1985. 6-Sandra Jane Nicholls was born on 12 May 1963. Sandra married Andy Colin Denmead. Andy was born on 12 Jun 1958. They had one daughter: Renee Jane. 6-Kerry Robert Nicholls was born on 24 Apr 1965. 6-Roseanne Rae Nicholls was born on 2 Jul 1969. 6-Brett Kenneth Nicholls was born on 16 Apr 1971. 4-Lorna Jessica Walker was born on 12 Dec 1906 and died on 31 Oct 1984 at age 77. Lorna married Cyril John Scott. Cyril was born on 4 Feb 1908. They had seven children: Terrance Robert, Dennis Lyle, Colleen Roselie, Estelle Maisie, Ila Nerelle, Beverley June and Geoffrey Winston. 5-Terrance Robert Scott was born on 15 May 1933. Terrance married Beverley Anne Bateup. Beverley was born on 20 Mar 1933. They had four children: Nigel Robert, Catherine Anne, David Paul and Stephen Phillip. 6-Nigel Robert Scott was born on 2 Jul 1959. Nigel married Wendy Bloomfield. Wendy was born on 30 May 1961. They had two children: Jacinda and Kara Jane. 7-Jacinda Scott was born on 18 Dec 1982. 7-Kara Jane Scott was born on 15 Dec 1984. 6-Catherine Anne Scott was born on 24 May 1961. Catherine married Adrian Rahariehi. Adrian was born on 6 Jun 1959. 6-David Paul Scott was born on 20 Jul 1962. 6-Stephen Phillip Scott was born on 28 Jul 1973. 5-Dennis Lyle Scott was born on 28 Nov 1934. Dennis married Janet Mary Leary. Janet was born on 30 Jan 1937. They had four children: Trevor Lyle, Gregory, Lindsay Rex and Denise Karen. 6-Trevor Lyle Scott was born on 9 Feb 1957. Trevor married Leigh Christine Goodwin. Leigh was born on 8 Jul 1956. They had one son: Cameron Lyle. 7-Cameron Lyle Scott was born on 28 Jul 1984. 6-Gregory Scott was born on 22 Jun 1961. 6-Lindsay Rex Scott was born on 24 Sep 1965. 6-Denise Karen Scott was born on 20 Jun 1968. 5-Colleen Roselie Scott was born on 15 Apr 1936. 5-Estelle Maisie Scott was born on 22 Feb 1939. 5-Ila Nerelle Scott was born on 4 Jan 1942. Ila married Donald John Reddish. Donald was born on 30 May 1944. They had three children: Donnah Michelle, Angela Maree and Bryan Jack. 6-Donnah Michelle Reddish was born on 27 Feb 1968. 6-Angela Maree Reddish was born on 25 Jul 1969. 6-Bryan Jack Reddish was born on 16 Jul 1972. 5-Beverley June Scott was born on 1 Jun 1944. Beverley married Graham John Hosnell. Graham was born on 8 Aug 1926. They had two children: Andrew John and Katrina Ann. 6-Andrew John Hosnell was born on 23 Jul 1969. 6-Katrina Ann Hosnell was born on 4 Mar 1971. 5-Geoffrey Winston Scott was born on 28 Aug 1949. Geoffrey married Merys Heather Scheib. Merys was born on 8 Jul 1955. They had three children: Shannon Geoffrey, Che Levi Winston and Brittony Jessica. 6-Shannon Geoffrey Scott was born on 2 Sep 1974. 6-Che Levi Winston Scott was born on 14 Mar 1979. 6-Brittony Jessica Scott was born on 9 Oct 1981. 4-Cyril William Walker was born on 13 Sep 1912. Cyril married Violet Harvey. Violet was born on 22 Nov 1916. They had four children: Baden Cyril, Clive Wilson, Eileen Janice and Jennifer Violet. 5-Baden Cyril Walker was born on 13 Aug 1940. Baden married Sandra Finnirnan. Sandra was born on 26 Oct 1946. They had two children: Sharon Marie and Craig Baden. 6-Sharon Marie Walker was born on 28 Mar 1966. 6-Craig Baden Walker was born on 12 Aug 1969. 5-Clive Wilson Walker was born on 23 Jan 1943. 5-Eileen Janice Walker was born on 31 May 1945. Eileen married Barry Chapman. Barry was born on 4 Jun 1936 and died on 5 Mar 1987 at age 50. They had two children: Dion Wayne and Lyn Maree. 6-Dion Wayne Chapman was born on 1 May 1969. 6-Lyn Maree Chapman was born on 26 Jun 1971. 5-Jennifer Violet Walker was born on 4 Oct 1950. Jennifer married Kevin Paixe. Kevin was born on 4 Jun 1949. They had three children: Nathan Kane, Wade Dallas and Krystal Leigh. 6-Nathan Kane Paixe was born on 12 Jul 1974. 6-Wade Dallas Paixe was born on 26 Apr 1976. 6-Krystal Leigh Paixe was born on 27 Dec 1982.